At planting (preferably in spring), if trees have an unbranched trunk greater than 2 feet tall, the tree should be headed back. This procedure should induce other buds along the trunk to shoot. Always remove leaves at positions where new shoots are required. Leaf removal is important since the petiole covers the bud and prevents bud break. Lower branches with weak crotches (less than 45°, or greater than 90°) should also be removed. During the first summer one shoot is encouraged to dominate by lightly pinching back the other shoots and loosely tying the main shoot to the stake. This shoot (leader) will become the tree trunk. About every three months some pruning can be performed to rapidly create a large framework. Select primary scaffolds beginning with the lowest facing the prevailing winds. Select additional scaffolds, upward along the leader at intervals of several inches or more, to form a spiral pattern around the trunk. Head these scaffolds to 18 inches in length to maintain the central leader. Remove strong unsymmetrical growth not required as the leader or scaffold branches. Also remove any limbs with weak crotches. The position of scaffold branches can be selected by removing a leaf in the desired position, thereby uncovering the bud. In subsequent years continue to select primary scaffold branches until four to six are present. Then allow the leader to become the topmost scaffold. Continue to head back scaffolds. Each time they are pruned, they tend to produce two strong end shoots. One or two weaker shoots might also form, these should be removed. As the pattern continues, the tree will gradually open up. How heavily to prune depends on the variety and the tree's vigor as judged by the tree spacing, soil and climate. Unpruned trees initially bear substantially more fruit, but as the canopy becomes crowded, the inside becomes devoid of leaves and fruit, and production moves to the outside of the canopy. As a consequence, it is more difficult to pollinate and harvest, and more damage to fruit from branch rubbing is encouraged. From the third or fourth year from planting the goal should be to prune about 6 to 8 inches from the new growth. This pruning should be done in the spring prior to bloom. If there is excessive growth during the summer, a light fall pruning may be necessary. However, heavy cropping will retard vegetative growth. Each year branches that are crowding the center need to be thinned out along with dead wood. Fruiting wood that has grown more than 18 inches from the scaffolds also needs to be headed back to prevent the limbs from breaking with the weight of fruit. The best level of pruning is going to be determined by experience. The severity of pruning will vary according to the lateral growth each season and cropping level. Other guidelines are to avoid too much shading within the canopy and to allow enough room between branches so that fruit will set clear of limbs and other fruit. A sure way to generate controversy among citrus growers is to initiate a discussion on navel orange tree pruning. Some growers maintain that yield and fruit size is best maintained by minimal pruning, while others believe that the number of large fruit is increased when trees are severely pruned. A ‘standard’ manual pruning for navel oranges does not exist, but the closest thing to it is a procedure that involves pruning from the tree; 1.) shaded, dead branches 2.) branches which cross from one side of the tree to the other and 3.) green, triangular, juvenile shoots from the tree. This type of pruning commonly goes under the name of ‘deadbrushing’. Deadbrushing is a relatively light form of pruning, and a trained crew usually spends less than 15 minutes per tree performing it. In addition to any manual pruning, most navel orange orchards in California are mechanically ‘hedged’ and ‘topped’ to provide continued access to trees and their fruit by equipment and people involved in orchard cultural and harvest activities. 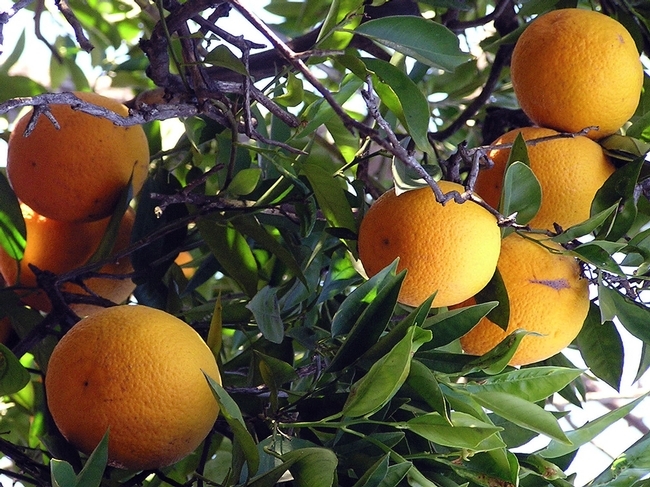 Although growers have been growing navel oranges in California for over one hundred years, surprisingly few experiments have been conducted to determine the effect of pruning on navel orange yield and quality. To assist in providing some guidance related to pruning and its possible effects on fruit yield and quality, an experiment was established in 2000 in northern KernCounty in an orange orchard that was typically harvested in late December or in January. In 2000, 2001, 2002 and 2003, yield, fruit quality parameters and manual pruning costs were compared among mature “Frost Nucellar” navel trees (90 trees/acre) having one of three topping-height treatments (14 ft, 16 ft, and untopped trees). In addition to a topping treatment, the experimental trees were given one of three levels of manual pruning 1.) removal of several large scaffold branches in March of 2000 followed by deadbrushing in 2001, 2002 and no manual pruning in 2003; 2. dead brushing only in 2000, 2001, 2002 and no manual pruning in 2003; or 3. no topping or deadbrushing). Data were collected from experimental trees surrounded by similarly topped and manually pruned border trees. Fruit weight, numbers, size, grade and color were determined the day after harvest at the University of California Research and ExtensionCenter experimental packline near Lindcove, California. The year, in this report, refers to the year that the crop bloomed and not to the year of harvest. For the 2003 crop year, even after 4 years, trees that were severely pruned in the spring of 2000 produced less total yield and less fruit in the most valuable-size range (i.e. 88 to 48 fruit/carton) than trees that were deadbrushed or left unpruned. In 2003, differences in yield among manual pruning treatments were greater than in 2002, probably because of the higher yield potential that appeared to exist across the industry in 2003. The canopy of the severely pruned trees in 2003 had not yet retained the size of the deadbrushed or unpruned trees after four years, which limited their potential fruit production. In contrast, in 2001 only one year after the manual treatments were imposed and a year with high spring temperatures and very poor fruit set, no differences in yield were found among manual pruning treatments. When the data of average individual tree performance are summed over the four years that this experiment was conducted, the treatment that included removal of some major scaffold branches in March of 2000 with deadbrushing in 2001 and 2002, was inferior in terms of yield, fruit number, and number of valuable-sized fruit in the range of 88 to 48 per carton than to trees that were only deadbrushed or those that had no manual pruning. Most of the detrimental effects of severe pruning on yield (and on fruit quality) occurred at the December harvest following the severe pruning in March 2000. Over the four years of the experiment, the trees that were not manually pruned produced equal or better cumulative yields of fruit, equal or more valuable sized fruit, and fruit with equal grade compared to deadbrushed or severely pruned trees. The percentage of the fruit on the tree larger than size 88 was greater in the severe pruning treatment, but because total fruit number per tree was less and more of this fruit was overly large (i.e. greater than size 48) the number of the most valuable-sized fruit/tree (sized 88 to 48) was less. Obviously, the trees that were not manually pruned had no associated manual pruning costs when compared to the other two pruning treatments. Manual pruning costs, from 2000 through 2003, not including stacking and shredding of pruned brush, were $8.50/tree for the deadbrushing treatment and $13.00/tree for the severe manual pruning treatment. Fruit yield or quality was not different among topping heights in any of the four years of the experiment. Topping height did not affect yield, probably because of the wide spacing and tall trees in this orchard. The canopies of untopped trees had little fruit within 4 feet of the ground as a result of shading of the lower canopy by neighboring trees. Removing the top 4 feet from an 18-foot tall tree moved the fruit-bearing volume downward in response to greater light penetration into the lower canopy but did not decrease the volume of the tree that received sufficient light to produce fruit. This effect was in contrast to severe manual pruning, which reduced the volume of the unshaded canopy overall, limiting the volume available for fruit production. A highly significant positive-linear correlation was found in the data across the four years and treatments between the total numbers of fruit produced per acre versus the total number of fruit sized 88 to 48 per carton produced per acre. This functional relationship existed whether reductions in fruit numbers produced per acre were the result of severe pruning in March or from weather-related phenomena such as occurred in 2001, suggesting that anything that reduced fruit numbers below approximately 130,000 fruit per acre resulted in a decrease in the number of fruit sized 88 to 48 per carton in this orchard. Of course, there are other reasons to manually prune orange trees, other than to improve fruit size. If certain insects, like California red scale or cottony cushion scale have been a problem, pesticide spray coverage may be improved by making the canopy less dense through pruning and fruit quality may be improved by making this investment. In general, what this pruning research has reinforced is the concept that growers should know why they are pruning orange trees and that manual pruning is unlikely to increase the number of fruit in the most valuable size ranges. 1Fruit sizes refer to number of fruit that fit into a standard California 37.5 lb. carton. 2 The severe treatment refers to the treatment that included removal of two or more major scaffold branches in spring 2000. To assist in providing some guidance related to pruning and its possible effects on fruit yield and quality, an experiment was established in 2000 in northern Kern County in an orange orchard that was typically harvested in late December or in January. In 2000, 2001, 2002 and 2003, yield, fruit quality parameters and manual pruning costs were compared among mature “Frost Nucellar” navel trees (90 trees/acre) having one of three topping-height treatments (14 ft, 16 ft, and untopped trees). In addition to a topping treatment, the experimental trees were given one of three levels of manual pruning 1.) removal of several large scaffold branches in March of 2000 followed by deadbrushing in 2001, 2002 and no manual pruning in 2003; 2. dead brushing only in 2000, 2001, 2002 and no manual pruning in 2003; or 3. no topping or deadbrushing). Data were collected from experimental trees surrounded by similarly topped and manually pruned border trees. Fruit weight, numbers, size, grade and color were determined the day after harvest at theUniversityofCalifornia ResearchandExtensionCenterexperimental packline near Lindcove,California. The year, in this report, refers to the year that the crop bloomed and not to the year of harvest. For the 2003 crop year, even after 4 years, trees that were severely pruned in the spring of 2000 produced less total yield and less fruit in the most valuable-size range (i.e. 88 to 48 fruit/carton) than trees that were deadbrushed or left unpruned. In 2003, differences in yield among manual pruning treatments were greater than in 2002 probably because of the higher yield potential that appeared to exist across the industry in 2003. The canopy of the severely pruned trees in 2003 had not yet retained the size of the deadbrushed or unpruned trees after four years, which limited their potential fruit production. In contrast, in 2001 only one year after the manual treatments were imposed and a year with high spring temperatures and very poor fruit set, no differences in yield were found among manual pruning treatments. Of course, there are other reasons to manually prune orange trees, other than to improve fruit size. If certain insects, likeCaliforniared scale or cottony cushion scale have been a problem, pesticide spray coverage may be improved by making the canopy less dense through pruning and fruit quality may be improved by making this investment. In general, what this pruning research has reinforced is the concept that growers should know why they are pruning orange trees and that manual pruning is unlikely to increase the number of fruit in the most valuable size ranges. Avocado Farming with High-Priced Water. Can It Remain Profitable? Water prices in San Diego County continue to increase and there is no end in sight, especially with periodic drought years and California losing some share of its Colorado River water. It is easy to see the response from growers; water is being turned off in many of our districts leaving acres and acres of dying trees. The water districts get nervous because there is not enough money coming in to cover their fixed costs, so they raise the price of water. And, they raise it again. The math is simple. Some of our water districts are selling water to growers for $1200 - $1300 per acre foot. At a water requirement of about four acre feet per acre for avocados in the inland areas of San Diego County, water will cost $4800 - $5200/acre per year. If you are producing 5000 lbs per acre (the average yield in California for the last five years) and receive $1/lb for your fruit, you get less than your water costs. And that doesn’t consider labor costs, fertilizer, taxes, insurance, vehicle costs etc. Profits? Are you kidding? Are we done? Either prices for our fruit have to increase, or we have to increase the yield per acre. As for prices, we don’t have control over market prices; they rise and fall with demand by consumers, on and off years in our groves and interference with Mexican, Chilean and now Peruvian imports. Can we increase yield per acre? The private consultants and the farm advisors have spent our careers trying to help growers with proper irrigation scheduling and balancing out the pressures and flows, proper fertilization, controlling thrips and persea mites at the right time, and dealing with avocado root rot (which continues to be a huge problem). Despite good farming practices yields per acre have not increased dramatically for most growers. To be fair, some growers are doing quite well with good farming practices, good weather and good soil. but It will probably take a dramatic increase for most of the growers to stay in business in San Diego County. I saw a dramatic increase in yield per acre recently in two groves, one in Temecula (owned by John Cornell) and one in the southern area of Escondido (owned by Steve Howerzyl). The Temecula grove produced over 30,000 lbs/ac in the sixth year from planting and the Escondido grove produced 24,195 lbs/ac in the fifth year. Both are high-density groves planted on a 10’ x 10’ spacing (435 trees/acre). This kind of production is exciting and might bring hope to avocado production for the future in San Diego County. Yield data is supplied in Table 1 and 2. Table 1. Hass avocado yield data supplied by the grower for a high density planting in Temecula. 384 trees /acre = 0.88 acre. Yield data adjusted to pounds/acre. Table 2. Hass avocado yield data supplied by the grower for a high density, non-pruned planting in Escondido. Yield data is supplied in pounds/acre. However, both groves have problems! The Temecula grove had a low fruit set in the spring of 2011. (This was the reason I was called out to look at it). Of course a large part of the problem is the inherent on/off cycle in avocados. However, in order to keep these trees in a high density situation without crowding, the grower had to prune the trees. In the late winter/early spring of 2011 every tree was pruned on all sides and topped at 8-9 feet. This effectively removed a lot of the fruiting wood and the trees had a reduced flowering and fruit set as a result. Remember, the Hass avocado flowers and sets fruit primarily on the outside of the tree canopy. The Escondido grove was not pruned and all of the trees had grown into each other, creating an incredibly crowded grove. It was so crowded that the irrigator was complaining that he couldn’t get through the grove to check the sprinklers. The grower commented that his plan was to remove all of the trees in the eighth year and start over again according to the Hofshi idea that was suggested several years ago. (More on this later in this article). I like the idea of close spacing for increasing yield per acre, but both groves need a good idea for maintaining the spacing and yet produce fruit every year. I proposed pruning in a three year rotation; the southwest side would be pruned the first year, the northeast side pruned in the second year, and the tree would be topped at eight feet in the third year. Then the whole process would start over again. By using this method there would always be fruiting wood on the tree. And it is an easy method to teach grove workers. The only problem with this pruning idea is that we have never tried this in a trial. This is why I proposed a trial to the California Avocado Commission to set up a high density trial with Hass and Lamb Hass, comparing two pruning methods: complete pruning each year vs. the three year rotation idea. The Commission liked the idea and they funded the trial, along with grower education classes. The trial and the classes will commence in the summer of 2012. To compete in the international market with low avocado prices will require more efficient farming and a significant increase in productivity. Young trees are vigorous, produce large fruit early, have better canopy to root ratio and reach peak productivity approximately by 7 to 8 years. Smaller trees are easier and less expensive to harvest, particularly when sixe picking is done, and are very amenable to snap harvest. In the last few years in California we are seeing a severe reduction in our labor force for harvesting. Pickers are getting picky; they have cell phones and they can call around to find the groves that can be harvested from the ground. Lugging a ladder around on a steep slope is just not desirable, and they can make a lot more money if they don’t have to use ladders. Researchers in other countries have been interested in high density plantings and many of the new plantings in Chile are planted in high density patterns. Ernst and Ernst, growers and nursery owners in South Africa maintain that high density can only be successful if the trees are pruned to a central leader immediately after planting, and maintained in that manner through the life of the tree. They are working with a Hass-like variety known as ‘Maluma’ which has more of a natural central leader than does ‘Hass’. Pruning. Growers in California have traditionally avoided pruning. Other than stumping periodically if the trees get too tall, not much pruning is done. One of the reasons is the labor to prune. It is difficult to determine from work done in foreign countries how much labor is involved in high density because many of the areas use the growth retardant paclobutrazol, a chemical we are not allowed to use in the U.S. We will keep track of our labor costs in our trial and will report this to growers interested in high density plantings. 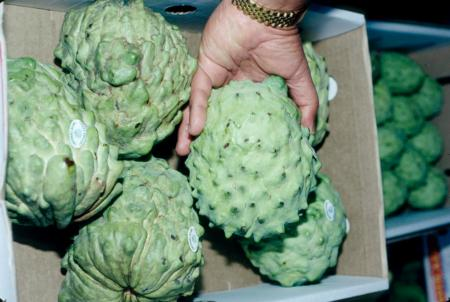 Can avocado growers survive in a county with high priced water? Possibly. High density plantings may be one solution to a really serious problem. But growers must continue with good farming practices such as a complete leaf analysis each year along with proper irrigation scheduling. Hofshi, R. 1999. High density avocado planting – an argument for replanting trees. Subtropical Fruit News. Vol. 8 (1). Ernst, Z.R. and A.A. Ernst. 2011. High density planting: a case study of central leader pruning with Maluma. Proc. VII World Avocado Congress 2011, Cairns, Australia 5-7 Sept. 2011. 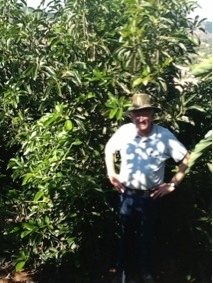 Steve Howerzyl in his high density avocado grove.